The National Institute of Mental Health (NIMH) estimates that in the United States, 16 million adults (6.9% of the population) had at least one major depressive episode in 2012. According to the World Health Organization (WHO), 350 million people worldwide suffer from depression. With such a large percentage of the population being impacted by depression, there is still a stigma associated with it, particularly around men suffering from depression. Even though women are twice as likely to have depression than men, male depression is no small issue with 5 million men in the US experiencing it. Men are less likely to notice their signs and symptoms, largely due to the widely-persisting cultural phenomena of keeping their emotions and feelings to themselves. Depression in men can often be overlooked and many men tend to focus on the physical symptoms that often accompany depression. Research finds that 60% of men do not go to the doctor for routine medical exams and this may result in the underlying depression going untreated. Men frequently ignore their symptoms or are less adept at recognizing them. As a result, friends and family members may play a critical role in identifying depression in men. Men experience many of the same depression symptoms as women. Men also experience signs of depression that may go unrecognized as being related to depression. For many, chemical imbalances may be the likely cause of depression. Talking to your doctor about your symptoms will help with a proper diagnosis and your physician may recommend therapy and medication to assist with brain chemistry. Beyond chemical imbalances, some major life events may also contribute to depression. Those who have gone through a divorce are more likely to experience depression and statistics indicate that men are more likely than women to suffer depression post-divorce. Other events that may impact depression include death of a loved one, retirement, major or chronic illness, persisting financial problems, quitting smoking, and relationship struggles. Overwhelming stress at home, work, or school may also play a role in depression. Persisting, long-term stress may have a negative on overall health, in turn leading to increased depressive risk. It can be uncomfortable to talk about depression, even with those you care about. When bringing depression up with a man, try to avoid using the word “depression” and focus on describing particular behaviors you’ve noticed have changed. It is crucial to use a caring tone and avoid sounding critical. You may also suggest that he schedule an appointment with his doctor, encourage him to make a list of symptoms and behavior changes, and offer to accompany him to the appointment. Sadly, men suffering from depression are four times more likely than women to commit suicide. It’s important for any man to seek help with depression before feelings of despair become feelings of suicide. Visiting a doctor to discuss thoughts, feelings, and symptoms will allow for proper treatment and monitoring. As a friend of family member of a man suffering from depression, perhaps the single most important thing you can do is encourage them to make an appointment with their healthcare provider. If at any point he mentions thoughts of suicide, get help from a crisis or suicide prevention hotline (try the National Suicide Prevention Lifeline at 800-273-8255) or call 9-1-1 or your local emergency number. 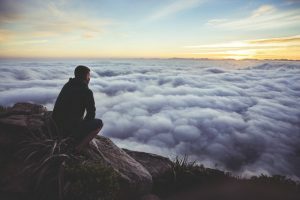 Many men are able to successfully overcome depression. In addition to doctor recommended treatments like therapy and medications, seeking social support and reducing stress may lead to feeling happier. As a friend or family member, consider reaching out to the individual and getting involved in activities to combat depression. Ultimately, you can’t “fix” someone’s depression, but you can provide support and encouragement. If you’d like to learn more about depression in men and men’s health issues, reach out to Northwest Primary Care.